Just in from the estate of the long time owner. 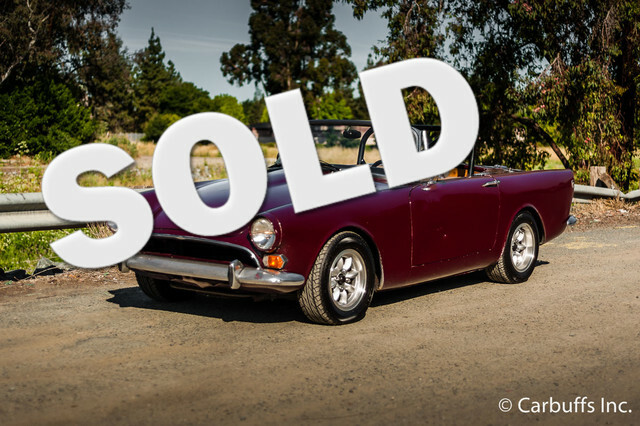 Sunbeam Tiger Owners Association certified and is in The Book of Norman. Excellent and very strong running 289/302 engine with 4 speed transmission. Obviously not a concourse car but is a blast to drive. Panasport rims. Roll bar. Soft top is in the well but the roll bar will need to be removed to use it. Owner had autocrossed the car some years ago and then it became a weekend cruiser. He bought the car in the early 1980’s and it has been garage kept since. Originally british racing green and now 30 plus years old burgundy. Does not appear to have ever been a rusty car. Engine fires right up with no smoke or odd noise. Definitely not a stock build and sounds great with a lopey cam and club headers. Also has aluminum heads, intake and a 4 bbl carb. Will pin you to the seat and handles great..